I was in Boots yesterday, on the look-out for some mascara but thought I'd try a new brand instead of my usual Max Factor. 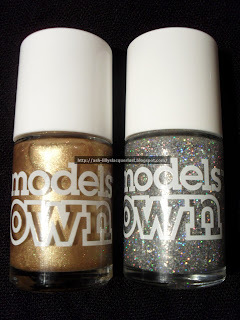 Everything seems to be buy-one-get-one-free or three-for-two in the lead up to Christmas, so imagine my delight when I saw an offer of a free Models Own polish with any two Models Own products. Not just any old free polish - a holographic glitter jelly called 'Juicy Jules'. As I did really need a mascara, I got one and I thought I'd pick a gold colour too and pick up my free gift. Gold Digger and Juicy Jules. I love glitter polish and I've now found The Glitter Collection I want them all!!!!! 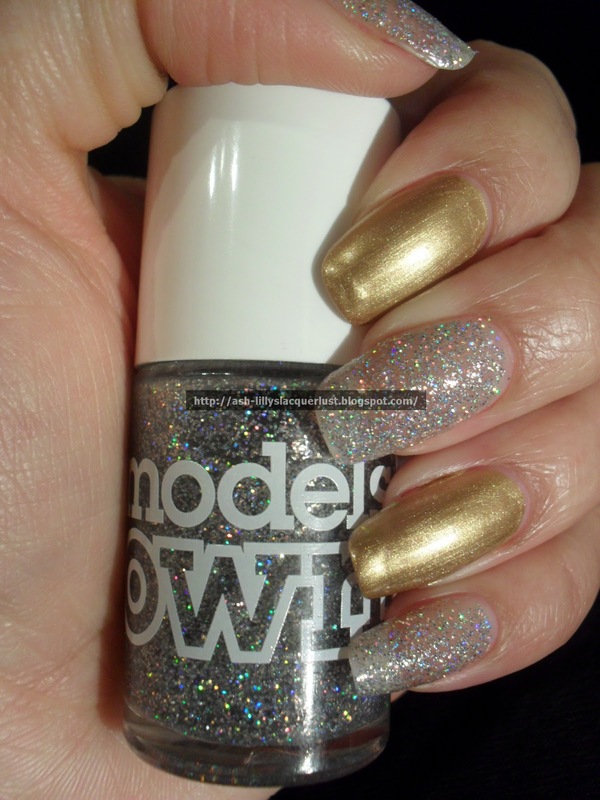 Please excuse the bobble on the index nail; that's the result of a cheapy basecoat, not the Gold Digger! Two layers of each colour and a very smooth application with both. I've found that with a lot of golds and silvers, there are streaks left behind, but not with this one. Also, I reckon that the glitter could have been made sheer with a further two coats but I liked it how it was. I think that gold would be complemented with a few brown stripes or delicate stamping. What do you think?